I skipped last week because of certain other events in my life, but this week, I return with the newly christened "Vulcan's View" (thank you to Eruptions reader Cindy for that suggestion). This week I will segue a bit from the Smithsonian/USGS Global Volcanism Program Weekly Volcanic Activity Report, so if you want to catch up on all the eruption-related news of the week, be sure to check that out in its entirety. As always, special thanks to the Global Volcanism Program and the NASA Earth Observatory for information and images! No less than three volcanoes on Russia's Kamchatka Peninsula appear in this week's GVP report, but the image today only has one of them — Shiveluch. However, not to be shortchanged, you also get Tolbachik, Bezymianny and Kliuchevskoi (that, along with Shiveluch, shows a wispy plume drifting eastward). 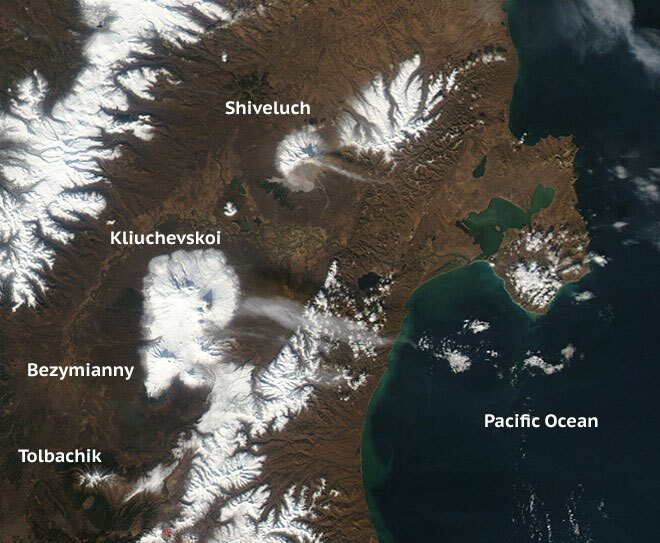 If you have a hankering for even more details about the Kamchatka volcanoes, be sure to check out the weekly updates that KVERT issues for these remote volcanoes. Image: A view of multiple volcanoes on Russia's Kamchatka Peninsula seen on Oct. 16, 2011. Image from the NASA Earth Observatory. Erik Klemetti is an assistant professor of Geosciences at Denison University. His passion in geology is volcanoes, and he has studied them all over the world. You can follow Erik on Twitter, where you'll get volcano news and the occasional baseball comment.